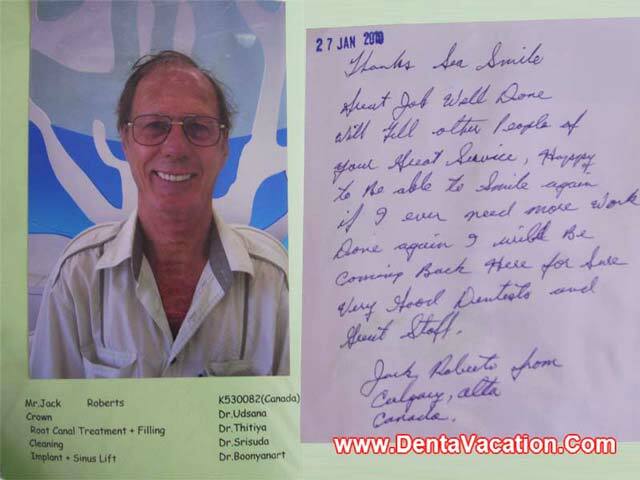 Jack Roberts, a resident of Canada, chose the dental clinic we work with in Patong, Phuket – Thailand for getting his smile revamped. His dental job comprised dental crowns, root canal treatment (RCT), fillings and cleaning, sinus lift, and dental implants. “Thanks…Great job. Well done. Will tell other people of your great service, happy to be able to smile again. If I ever need more work done again I will be coming back here for sure. Very good dentists and great staff. The clinic reviewed by the Canadian dental tourist is a well-equipped facility boasting of state-of-the-art technology and ISO 9001:2008 certifications for both the clinic and its in-house lab. The clinic receives a number of international tourists every year. Take a look at this video in which an Australian reviews the dental clinic in Phuket. Submit the free online quote-request form on the right for more information on dental treatment in Patong, Thailand.